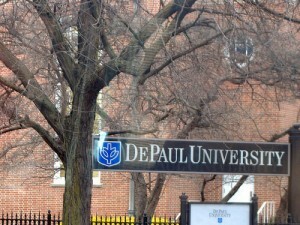 Housed on two city and four suburban campuses in the Chicago area, DePaul University is the nation’s largest Catholic university. With more than 23,000 students, it’s also one of the largest private schools in America and, in 2006, was honored by the Princeton Review for having the most diverse student population in the country. These days, it’s also the site of two very different controversies about the role of Israel in the world and what constitutes legitimate discussion on a university campus. In one, former adjunct Prof. Thomas Klocek is suing the university, saying he was wrongly terminated for a heated discussion with Palestinian students. In the other, the university recently rejected the tenure bid of Israel critic Norman Finkelstein, who has engaged in a public feud over his work with Harvard University Prof. Alan Dershowitz. The Klocek case stems from a Sept. 15, 2004, incident on the Chicago downtown campus. On his way to get coffee near a student activities fair, Klocek stopped off at a booth run by Students for Justice in Palestine and read a pamphlet the group was distributing. He describes the pamphlet as showing a photo of Rachel Corrie (an American activist killed while trying to disrupt an Israeli bulldozer in the Gaza strip) and demanding a right of return for Arab Palestinian refugees. Klocek says he felt the brochure oversimplified the situation and engaged the students in a discussion. In the discussion that followed, he says, he told the students that the term “Palestinian” has only recently applied specifically to Muslim residents of the land, whereas it was previously used for Muslims, Christians and Jews. He says one of the students compared Israel’s treatment of Palestinians to Nazi Germany’s treatment of the Jews, a charge he argued against. He then continued to debate the SJP students as well as a group of students from United Muslims Moving Ahead seated at the next table. The dispute comes over what happened next. Klocek says that, outnumbered 8-1, he saw “no point arguing with people whose minds were already made up” and walked away after about half an hour. The students told The DePaulia campus newspaper that he first threw their leaflets back at them and made an obscene gesture. They also said they asked him to leave several times and that when an official from Student Life, which organized the activities fair, asked him to leave a business card so they could continue the discussion at a later time, he refused. Within days of the incident, Klocek — who taught critical thinking, writing and research at DePaul for 14 years in the School of New Learning — was told by Susanne Dumbleton, dean of his department, that he would be suspended with pay for the winter quarter. He was informed in November that he could teach one class in the spring (instead of his usual two) if he agreed to have that class monitored and apologized to the students. He declined that offer and says he has never received a copy of the specific complaints against him. Klocek, who as a long-term adjunct received university benefits but was contracted quarter to quarter, says the DePaul system lacked a process for him to appeal the decision to the university. He says the academic senate did ask if he’d be interested in a hearing there, but, because academic senate rulings apply to only one quarter at a time, he felt such an appeal would lack teeth and chose not to pursue one. Instead, in June 2005, he filed a complaint against the university in Cook County court, seeking financial compensation. The charges were first upheld by a judge in May 2006, and six of the original eight counts were again upheld April 10 by circuit court Judge Daniel Kelley. Kelley upheld four counts of defamation against the university and three employees, and two counts of false light invasion of privacy. Klocek attorney Andy Norman says he plans to file an additional breach of contract count in the amended complaint and that he will request a trial date soon. With a trial date still pending, the Klocek case is unlikely to be decided until late this year or early next year. However, a resolution came much sooner in the case of Norman Finkelstein’s denied application for tenure. The professor, whose parents were both Jewish Holocaust survivors, is best known for books such as “The Holocaust Industry” and “Beyond Chutzpah: On the Misuse of Anti-Semitism and the Abuse of History,” in which he argues that “Jewish elites” have exploited the Holocaust to defend the actions of Israel, enriched themselves at the expense of survivors and ignored the suffering of non- Jewish Holocaust victims. Finkelstein has also called Nobel Prizewinning writer Elie Wiesel the “resident clown of the Holocaust circus” and has questioned whether all those seeking reparations from Swiss banks are actual survivors. He has publicly supported Hezbollah in some instances and compared Israel’s treatment of Palestinians to tactics of the Gestapo, saying that, as a Jew, he feels a particular responsibility to criticize Israeli policies he disagrees with. Earlier this year, DePaul’s political science department approved Finkelstein’s tenure application 9-3, and it was then sent to the College of Liberal Arts and Sciences. A committee there passed it 5-0, but the dean, Chuck Suchar, recommended against tenure in a memo sent to the university-wide Board on Tenure and Promotion (which represented the next step in the process). Suchar praised Finkelstein’s work in the classroom, noting positive course evaluations and the strong academic scores of his students, but argued that the “tone and substance” of his research and writing were insufficient for tenure. The Board on Tenure and Promotion reviewed the application, and the university provost made a recommendation to DePaul President Father Dennis Holtschneider based on the board’s vote. The board voted to deny tenure, and Holtschneider chose not to overrule that decision, meaning Finkelstein’s position terminates next June. “Over the past several months, there has been considerable outside interest and public debate concerning this decision,” the university president said in a statement. “This attention was unwelcome and inappropriate and had no impact on either the process or the outcome of this case. Harvard University Prof. Dershowitz ranks among those most often criticized by Finkelstein in his books, and the Harvard professor had urged DePaul to deny tenure. Dershowitz says he was asked to weigh in by former political science chair Patrick Callahan, and last fall he sent DePaul faculty a packet that responded to charges Finkelstein has leveled against Israel, Dershowitz and other Jewish writers. While Dershowitz stressed that he was specifically asked for his opinion, Finkelstein and some of his supporters see this as a case of a professor wrongly injecting himself into an intra-school matter. “In some ways, the decision’s not that important at all,” Dershowitz says. “He’s a soapbox orator, and he can still get a soapbox in Central Park and spew his drivel. It’s important only because of the attention the case has received and the way the media is misrepresenting the decision.